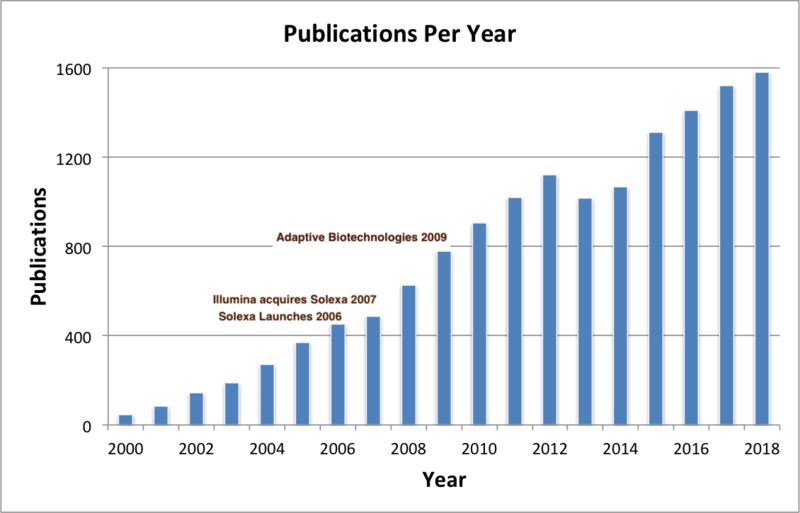 Growth of publications. Key points in technology and company development are indicated. Immunoprofiling, the quantitative measurement of antigen receptors (ARs; antibodies or T-cell receptors) in a sample, is a hot topic in biotechnology. In basic research, immunoprofiling is used to assess the diversity of antigen receptors (ARs: antibodies and T-Cell receptors) and how this diversity changes in response to allergens, infections, or vaccines. Understanding AR diversity helps scientists develop new vaccines, improve existing vaccines, and treat allergies and disease. In cancer therapy, such as certain leukemias, immunoprofiling is used to develop biomarkers that can be used to monitor treatments and detect remissions at early points. Immunoprofiling is also used to understand how individuals' immune cells fight tumors and predict an individuals' response to immunotherapy. The importance of immunoprofiling is clear. 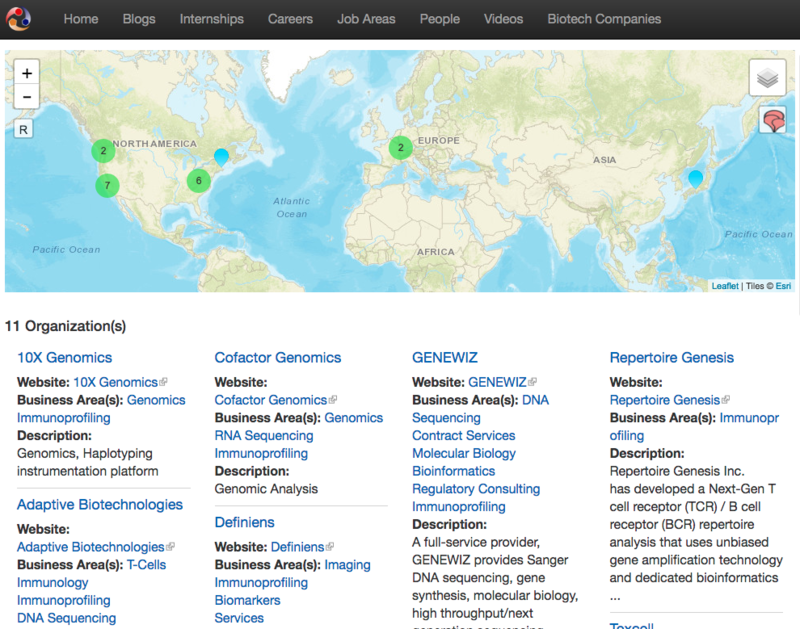 The Biotech-Careers.org biotechnology company database has 11 companies that offer specific immunoprofiling services or products. While small in the context of the entire Biotech-Careers.org 6700 plus biotechnology company database, the market for these companies is substantial. For example, when all the immunology terms are selected on Biotech-Careers “Browse Companies by Terms” page, 654 companies are returned. Other data, such as the number of publications containing the terms “immune profiling or immunoprofiling” in PubMed show increasing interest with nearly 1600 publications expected by the end of 2018. And, since 2011, NIH has invested over $176 million dollars in 179 projects related to immune profiling or immunoprofiling (data obtained from NIH RePORTER). Biotechnology companies that offer immunoprofiling services or tools. Today, immunoprofiling assays commonly rely on massively parallel, next-generation, DNA sequencing to determine the sequences in the region of highest variability between individual AR molecules within a sample. This region (Complementarity​​​​-Determining Region 3 [CDR3]) encodes the antigen binding domain of the AR. In these assays immune cells are isolated from tissue sources (blood, lymph, tumors, etc.) from one or more individuals, often over multiple time points. Next, mRNA or DNA is isolated from single cells, or in bulk, and prepared for sequencing by PCR using immune specific primers (details to follow in another post). 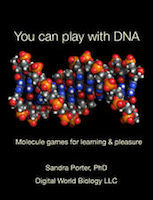 Each source material (RNA or DNA) has tradeoffs. RNA (via cDNA) sequencing measures AR diversity, clonality (frequency), and gene expression. As RNA represents expressed ARs, sequencing the RNA molecules that encode ARs measures functional immune molecules. However, differences in gene expression between immune cells and samples needs to be fully understood to assess clonality with high accuracy. Sequencing genomic DNA measures AR diversity and clonality. Because each cell will have only one copy of the AR’s DNA, DNA can more easily measure clonality accurately. The tradeoff with DNA being that it will measure any rearranged AR including those that will not be expressed. Hence, DNA assays will also contain a large number of non-functional AR sequences. Regardless of whether DNA or RNA is being measured, each sample in the assay will generally produce many thousands of sequences. The dataset of resulting sequences represents both AR diversity and AR frequency. A fist step in the data analysis is to compare the sequences to one and other to obtain a list of unique sequences and their counts. The sum of the unique sequences represent the AR diversity and the counts of each AR sequence are used to compute clonality. Next, the subregions of each AR (V [Variable], D [Diversity], J [Joining], and other bases) are annotated by comparing the unique sequences to AR reference sequences that are derived from different species (human, mouse, rat, others), AR type (BCR [antibody], or TCR [T-cell receptor]), and genes (V, D, J). These final data are used to study immune responses and develop biomarkers for other assays. In summary, immunoprofiling is a way to measure the state of an individual’s immune systems at a given point in time. As the observed ARs arise from specific immune responses, the set of AR sequences is a signature of the antigens that an individual has experienced. Allergens, infectious agents, chemicals, or emerging cancer can all elicit immune responses. Thus, if we could understand the relationship between AR sequences and the antigens that the encoded proteins bind, then AR sequencing could be used as a universal diagnostic. As one should expect this moonshot goal is underway . 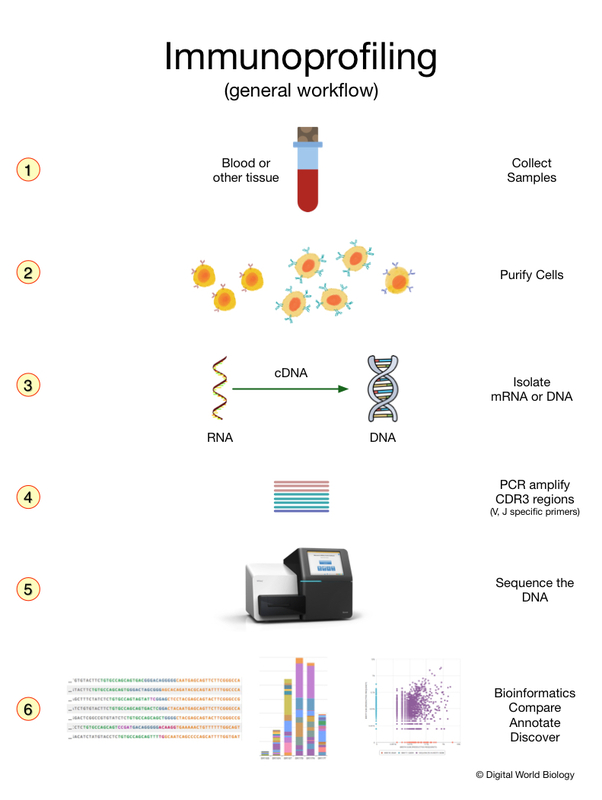 Basic steps of an immunoprofiling workflow. Publication counts were obtained by searching PubMed with the terms "Immune profiling" OR immunoprofiling.